Relaxation is the process of releasing tension and returning the balance of both the mind and body. Relaxation techniques are important in managing stress. Since stress is known to contribute to the development of many diseases, one needs an antidote to battle stress. In fact, relaxation might be one of the most essential factors in maintaining a healthy body and mind. Relaxation is so important that health professionals suggest the use of relaxation techniques to manage not only everyday-life stress but also the stress caused by health conditions. Relaxation techniques can benefit both psychological and physical health. There are a number of relaxation techniques that promote both psychological and physical health. Some techniques are taught and performed by experts. There are also techniques that you can use by yourself. One relaxation technique is called autogenic relaxation. This technique utilizes both body awareness and visual imagery in order to release tension and stress. One example of autogenic relaxation is picturing yourself in a peaceful environment and then focusing on controlling your breathing, heart rate, or other physical sensations. Most relaxation techniques, such as the three mentioned above, are usually performed with minimal movements and while lying or sitting down. These techniques are called passive or formal relaxation exercises. Relaxation techniques can also incorporate exercises such as yoga, gardening, Tai chi, and Qigong. 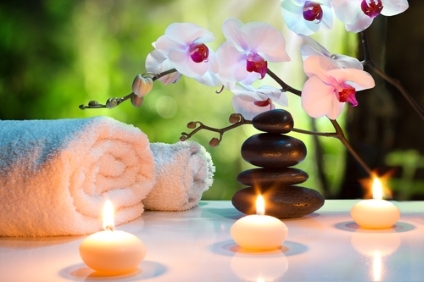 Bodyworks such as massage, reflexology, acupuncture and sauna use are also used to promote relaxation. Relaxation can bring about a number of physical health benefits. During relaxation, your heart rate and breathing slows down. Your blood pressure decreases, and the blood flow to your primary muscles is increased. Chronic pain and muscle tension are also significantly reduced when practicing relaxation techniques. The body systems including the circulatory, immune, gastrointestinal, and respiratory systems also function better. Relaxation has also been shown to improve certain health conditions. Skin disorders such as eczema, dermatitis, and psoriasis tend to improve upon relaxation. Heart burn, ulcers, asthma, emphysema, arthritis, migraine, epilepsy, premenstrual and menopausal syndromes, angina, fibromyalgia, insomnia, and diabetes mellitus are just some of the conditions which are known to improve with relaxation. Relaxation is a way to calm the mind. People who are practicing relaxation techniques are known to get better sleep. Relaxation can also help you keep your emotions in check leading to less bouts of anger and crying spells. Furthermore, it can increase your memory, concentration, and problem solving skills. Anxiety disorders, depression, and panic attacks are also known to improve with relaxation. Notice: The article you are reading is for your personal edification. The information contained therein is for educational purposes only and is not to be used in place of proper medical advice, nor is it intended to treat, diagnose or cure any ailments. One should always seek out a properly licensed medical professional to answer any questions or render treatment. As always please check with your doctor before engaging in any new regimen. Brownstoneshopper, an online gallery of uniquely sourced items for your home. Our company is now featuring The Relax Far Infrared Sauna. Medical technology in a portable, professional sauna that is easy to use, inexpensive to operate and travels well. Learn more, GET FREE REPORT! Sign-up at [http://www.brownstoneshopper.com/about/sign-up] for coupons, news and specials on this revolutionary product. Article Source: How Does Relaxation Benefit the Mind And Body?